How many milligrams are in an ounce, as you try to compare two packets of seeds that aren’t labeled with the same unit of measure, so you can figure out which one is the better deal? Is ‘French Breakfast’ a better radish then ‘Cherry Belle’, as you try to choose the one variety of radish you will grow in your garden this year? Will you be able to find all those tomato varieties at the garden center in the spring, as you nearly hyperventilate over dozens, if not hundreds, of tomato varieties, spread across all those seed catalogs, and almost get teary-eyed thinking about how delicious that first ripe tomato from your very own garden is going to taste? If you are asking yourself questions like those – just stop. Stop right now. You are going about this seed buying business all wrong. Price comparisons? There are too many seed companies offering too many of the same varieties to spend the time comparing prices across all of them. Just pick a few seed companies that you really like and order from them. What you might lose by spending a tiny bit more on one seed packet, you’ll probably make up in reduced postage. One variety of radishes? Or one variety of anything? What? Why not throw all caution to the wind and plant more than one variety of radish, or lettuce, or peas, or green beans or whatever it is you are going to grow in your garden. I’m all for buying the tried and true varieties for my garden, but I also like to try new varieties each year. After all, how much room does it take to plant a few extra radish varieties? And who knows what new variety will do quite well and become a new tried and true variety for you? Wait until spring to buy some tomato plants? You can take your chances that there may be a few more of those varieties available, but if you have your heart set on one tomato variety in particular, you’d better order the seeds for it and grow your own. It’s not that hard to do, I promise. 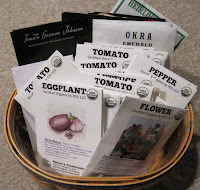 I’ll be ordering my seeds by next weekend and following my own advice – picking a few seed companies to order from, ordering extra varieties along with the tried and true, and not passing up that variety of tomato that I definitely must have. Thanks for the reminder. I've ordered most of my seeds already, but I have one order left that I need to get out - tomorrow! I'm with ya! Comparing prices gives me a headache. And no matter what, they always sell more seeds than I will likely sow. I did buy a few packets of my standbys locally this weekend - will send away for "cool" stuff this week. Bought seed starter mix, too, so no more excuses. Seeds and soil in hand. Ordered in early January. Packets are ready for the year. And I too threw caution to the wind and bought way to many new things to try. But it sure will be fun seeing what does best!!! Stay tuned. I am new to blogging but have been following your blog and others listed for several months. I appreciate the insights. Thank you. I've got my seed orders all spread out, and I like to use at least three or four seed companies. I want them all to know I love them. I like your advice. I order from two or three companies. I order what I know will grow then a variety or two that looks good to try. Happy gardening. I wish I had room for more than one variety of everything. Tough choices must sometimes be made. Great advice! I am still trying to keep myself from impulse buying - so tempted by all those pretty seed packets and tempting names like Black Valentine Beans. Ha, very good advice! I'm not usually a seeds type of person but since people keep giving me seeds, I've decided to give it a whirl. A farmer I know just received 142 different varieties of seeds and had another 22 varieties on back order! That's a lot of seeds. Wise advice from a woman who's been vegetable gardening since she was knee-high to a grasshopper. I used to figure the cost of seeds down to the penny, but discovered that you are right, the shipping will kill you before the difference in seed prices becomes significant. Too funny. I ordered my seeds a few weeks ago. Some have arrived and some not yet. Some I have started already as well. Like my tomato's. I want one now or as soon as I can so I jumped on that train....maybe a little too early but...and you are so right about picking a few and ordering from them. I had to do that myself.